Got a cool horse and need some financial help to achieve your dreams? Getting people to invest in your riding career or buy shares in a horse you’re offering for syndication is really, really difficult. The least you can do is to have a fabulous communication strategy. And that means a darn good presentation document. Of all your communications – I’m including everything from your business cards to social media posts here – what you’re going to send to potential sponsors and investors is the one that needs to be the absolute best. It must be well-designed, engaging, and leave the recipient wanting to pick up the phone and do business with you. Before you start gathering photos and designing, think about who you are, what you can offer and tailor a good pitch. While some riders can do this on their own, it really helps to bring in someone external to your business to identify your strengths and come up with a strategy to ‘sell’ you. I’ve done this exercise with a few riders now, and they can talk about how great their horses are all day long but when it comes to selling themselves, they have trouble. But this is not the time to be humble. Focus on what makes you great. Once you have your sales pitch ready, you’re ready to start designing. Think of your audience and what they would want to know. Who is this going to? Are the intended recipients familiar with the sport? Do they know who YOU are? If they are clueless about the sport or don’t know you from Adam, then you’ll have to communicate that effectively right off the bat. The reader wants to know quickly ‘What is this + who are you?’ Grab their attention immediately and get to the point. Make it simple and relatable. Use words like Olympic sport, champion instead of 1st place. Make a good first impression and keep them interested. Don’t waste anyone’s time by overwhelming them with information. Mistake riders make: Looooong, bland Wikipedia-style ‘What is dressage?’ or long list of results. They just started reading and you’ve already bored them to tears. Keep it short and sweet. 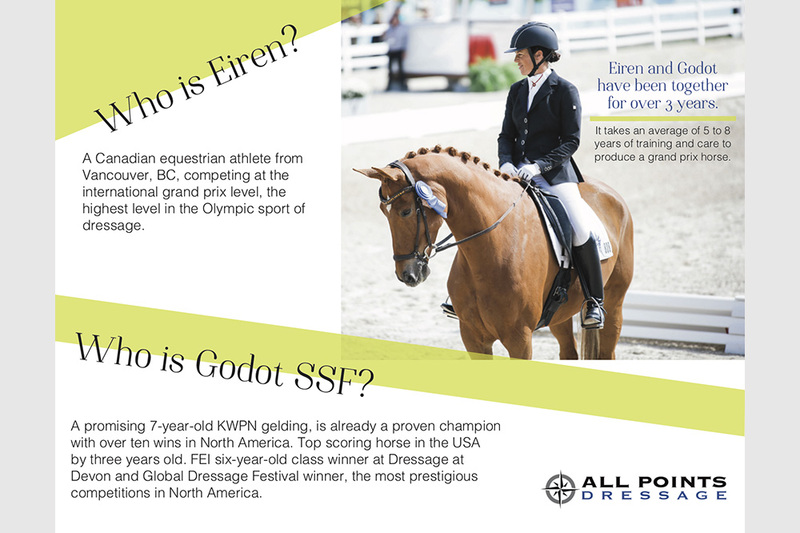 Here is an example we designed for Grand Prix dressage rider Eiren Crawford to send to potential sponsors and investors. We kept the paragraphs short and created an unexpected design to grab attention immediately. Once you’ve made the introductions. “Hello, here’s my sport, here’s who I am, here’s who my horse is,” let’s go deeper and give them a reason to care. Connect to the reader with emotion while establishing your credibility. 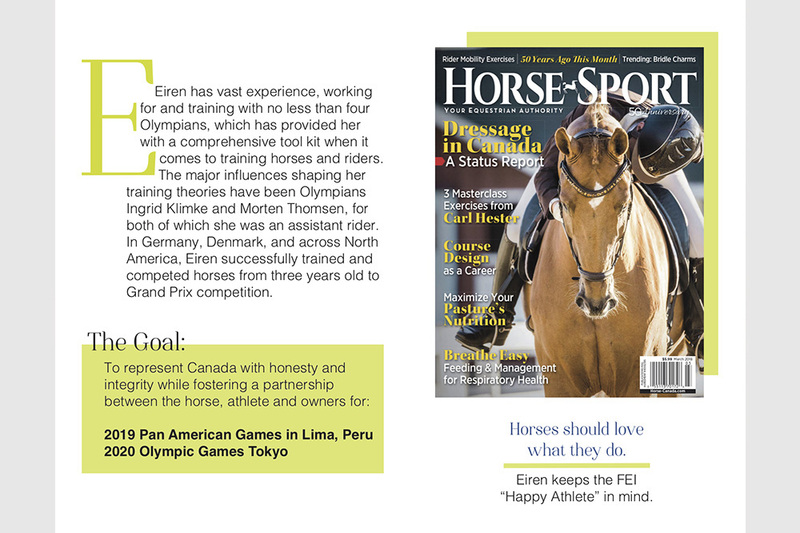 For example, in Eiren’s brochure in addition to her background and competition goals, we highlight the rider’s purpose and values. The goal is not simply to reach a certain level competitively but there’s a philosophy that goes along with that journey. The project then becomes more than just reaching a competitive goal. Sponsors want to be part of a bigger purpose that aligns with their own values. 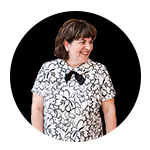 Mistake riders make: They forget to evoke emotion and give the reader a reason to care. Overall, you need to stand out. Create the unexpected with design, describe what makes you different as an athlete, and give the readers only what they need in the beginning to grab their attention. You have to show the potential sponsor or investor how much it’s going to cost: buy-in fee, on-going costs or financial levels of involvement. And then what they’re going to get out of it. Financially, in visibility, be specific and show the benefits of the investment. If you’ve had a previous syndicate in which members had a profitable experience, use the data and testimonials. If it doesn’t sound like a good deal to you if you were on the other end, good luck convincing strangers to part with their money. Be clear, concise and make sure it’s written for the intended recipient, not for yourself. It’s easy to over-explain things or add useless information. Mistake riders make: They focus too much on their own needs and not enough on the investor’s. As I mentioned earlier, bringing an outside marketing specialist can help you zero in on the points to highlight. Many riders don’t know where to start and simply hire a designer to produce the brochure, and skip important steps. You only get one opportunity to make a first impression, make it count.